After recovering from our chocolate coma, we were treated to the cultural smorgasbord of the Archaeological Museum of Saint-Romain-en-Gal in Vienne where visitors can explore extensive archeological ruins to get a peek into the prosperous Roman town 2000 years ago. A contemporary structure to house ancient digs. The Archaeological Museum showcases the crafts, architecture and daily life of ancient Vienne. Its 7-hectare site is in a large residential area that includes posh villas with colonnaded gardens and intricate mosaics. The museum’s exhibits are more like works in progress. 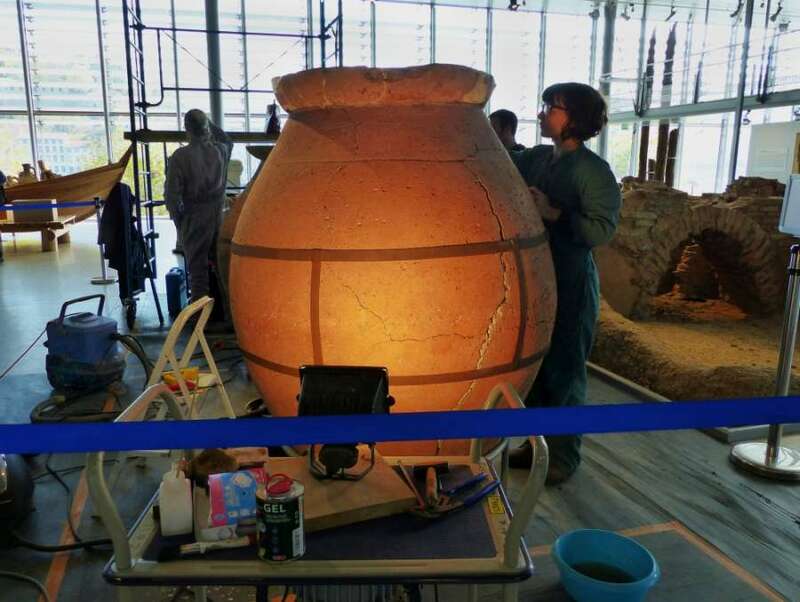 Archeologists and technicians were painstakingly cleaning artifacts, like this giant dolium, throughout the space. During our visit, we managed to walk on scaffolded excavations, check out scaled models and even saw a group of grade schoolers in the midst of a historic re-enactment! This video, though narrated in French, impressively recreates ancient Vienne in Gallo-Roman times. 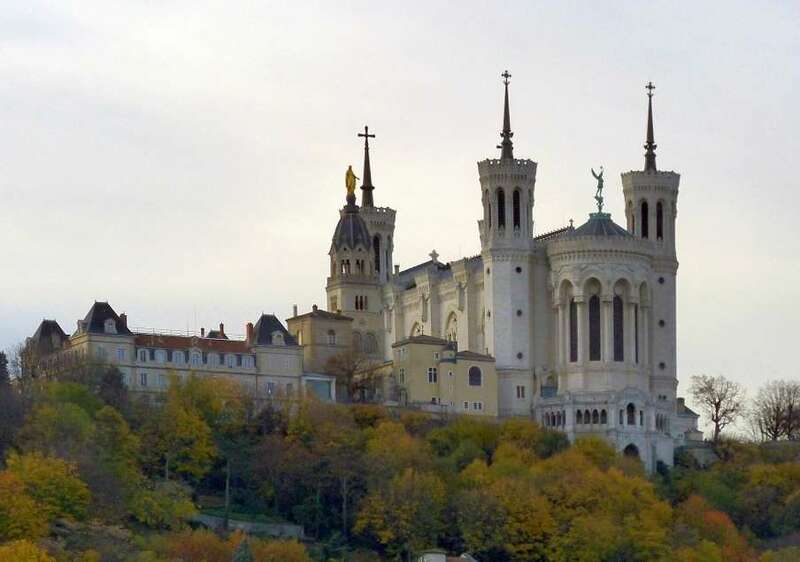 The imposing Basilica, perched on Fourvière hill, is a famous landmark at our next port. The Basilique Notre-Dame de Fourvière (Basilica of Notre-Dame de Fourvière), highly visible around the city, is a mix of Romanesque and Byzantine architecture with 4 main towers and a bell tower topped with a gilded statue of the Virgin Mary. Bell tower with Basilica aglow in the distance. We reached Antonin Poncet square in the dusk. This bell tower was salvaged from a major hospital that was razed for redevelopment. In the foreground is Korean pop artist Choi Jeong Hwa’s Flower Tree Sculpture. 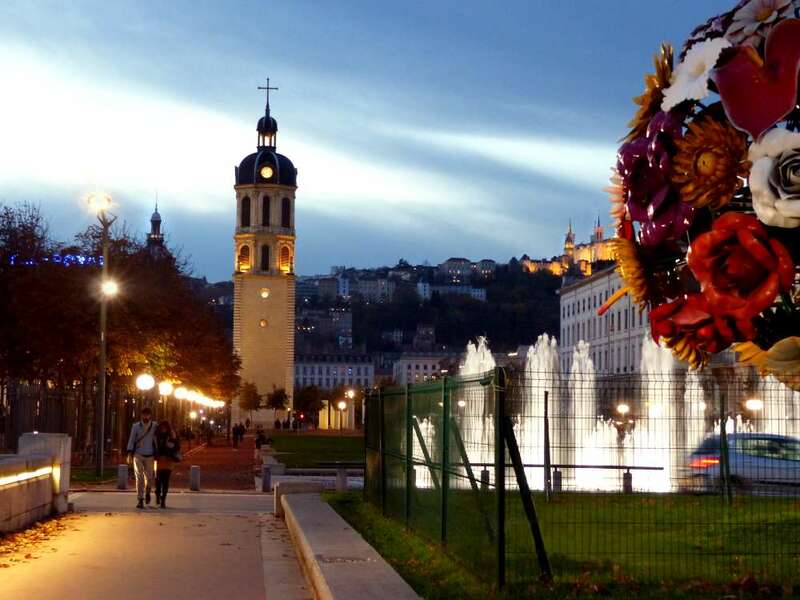 It is a ‘bouquet’ of 85 flowers almost 20 ft tall and made of stainless steel with a durable polyester resin coating. Aptly named Le Palais de l’Université (Palace University) at night. 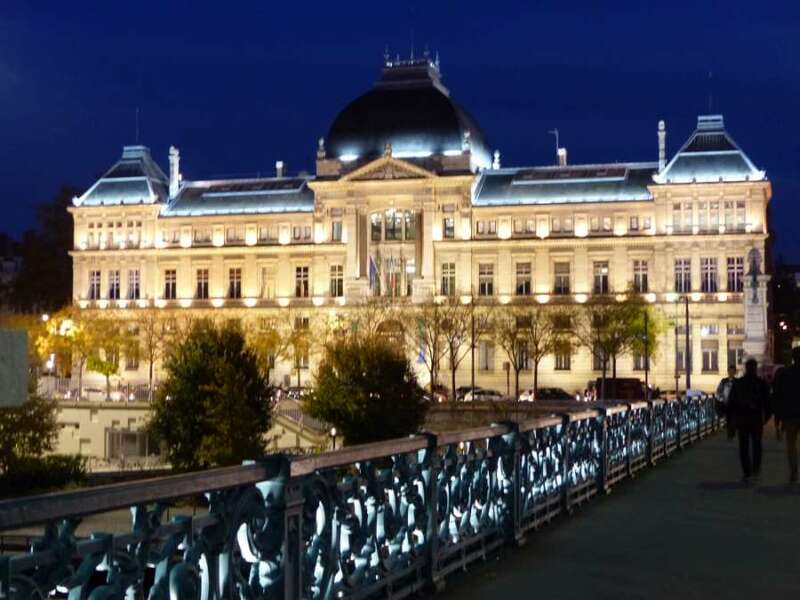 The beautifully illuminated university and Pont de l’Université (University Bridge) are in the tradition of France’s grand Renaissance chateaus. 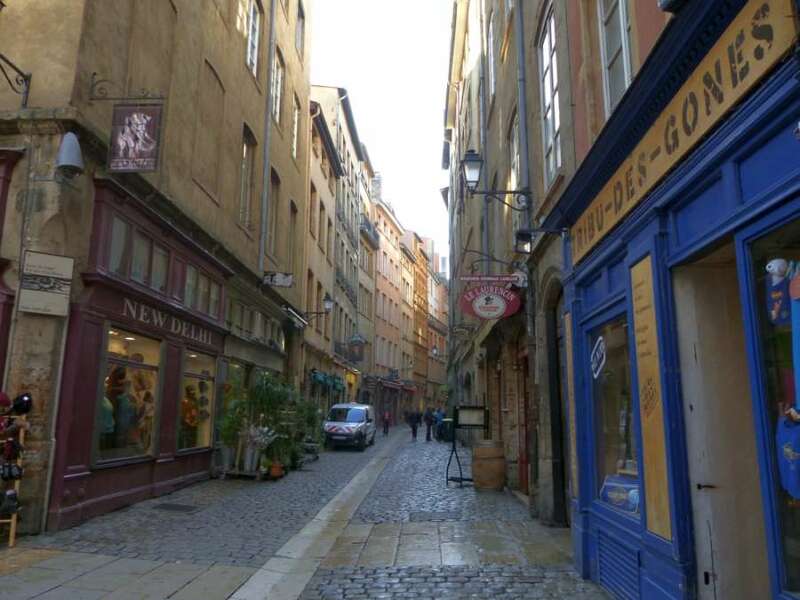 Being one of the largest Renaissance neighborhoods in Europe has earned Vieux Lyon (Old Lyon) a UNESCO Site designation. This street is in the Saint Jean quarter close to Cathédrale St-Jean which dates back to the Middle Ages. Hyper-realistic murals scattered around Lyon are fun and free. One of the most popular is this series of trompe-l’œil paintings by CitéCréation of famous Lynonnais such as the Lumière brothers, the first film makers, and Paul Bocuse, the godfather of Gastronomy. 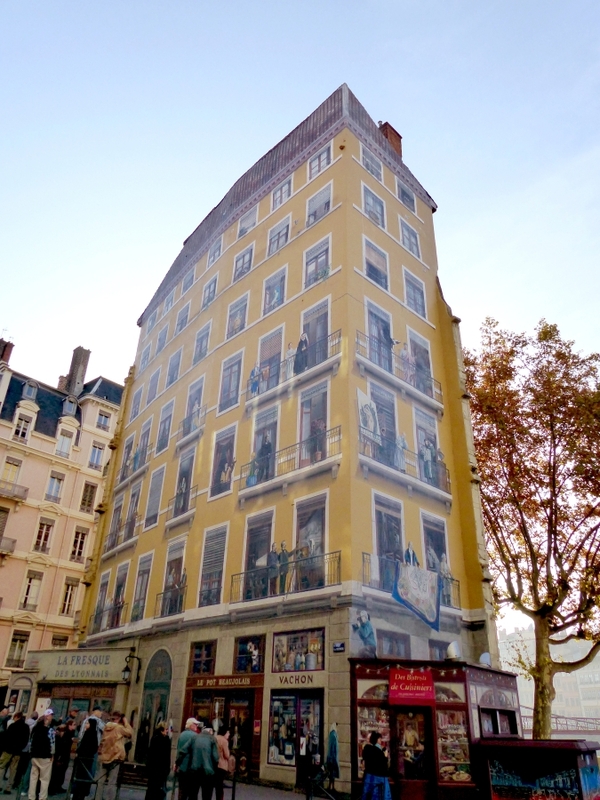 This wedge-shaped building is at the corner of Rue de la Martiniére and Quai St Vincent. 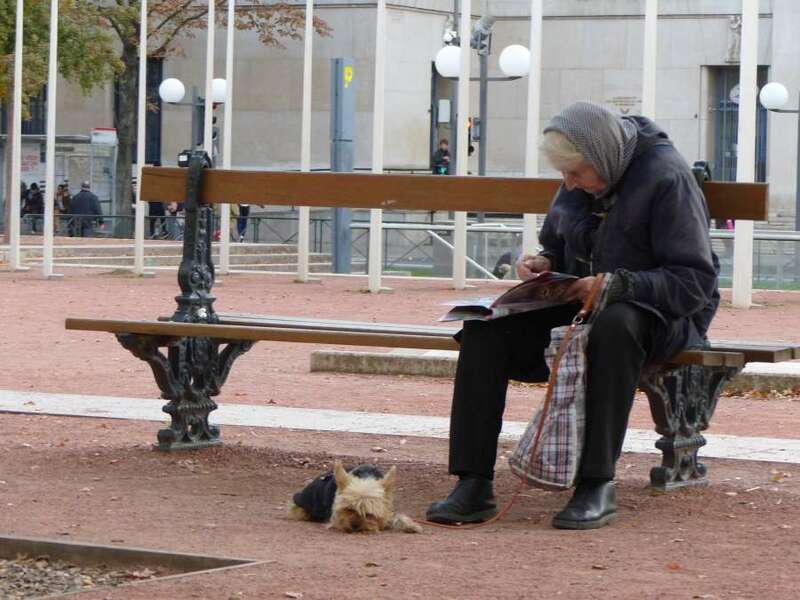 We took one of the ship’s walking tours and came upon this old lady reading intently with her warmly dressed dog in the park. A juxtaposition of the new and the old at Place des Cordeliers (Cordeliers Square). 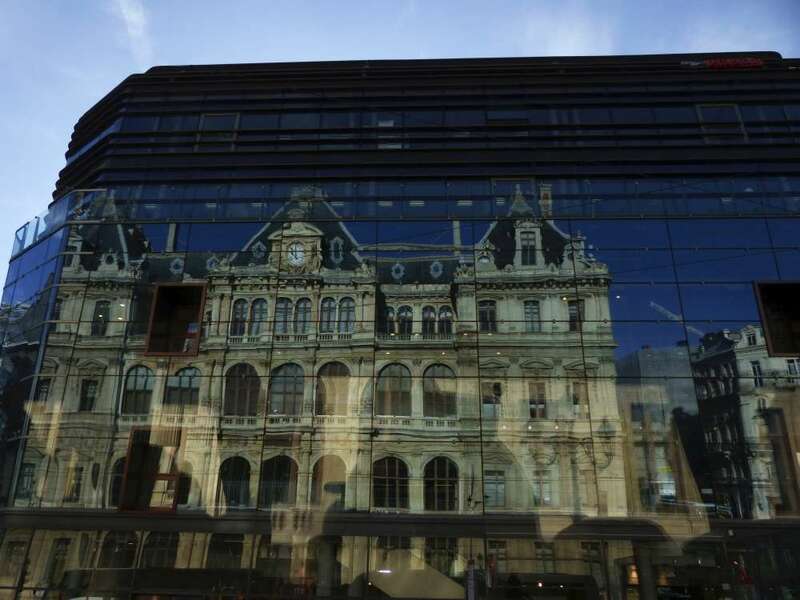 Reflections of the Palais de la Bourse (Stock Exchange Palace) mirrored in the glass façade of the Monoprix shopping Center. Architect René Dardel’s imposing neoclassical building was inaugurated by Emperor Napoleon III in 1860 and included the Stock Exchange, Commercial and Labor Courts, Chamber of Commerce and a Museum of Art and Industry. A trio of über contemporary ‘ship-stoppers’ along Quai Rambaud. 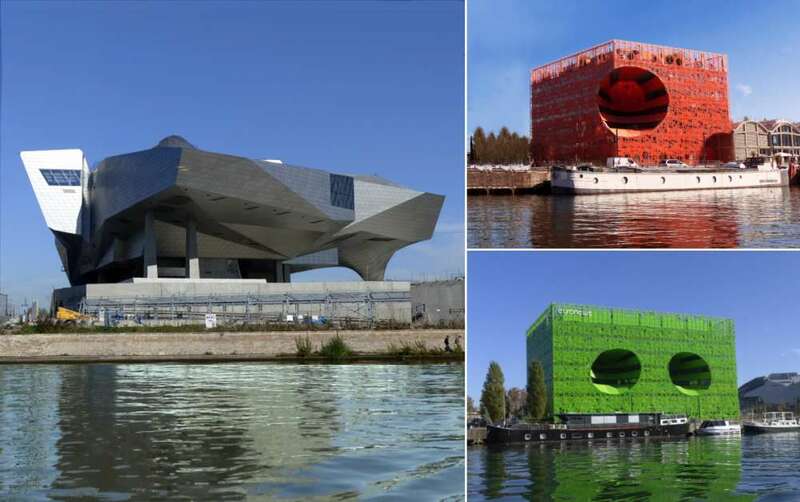 These avant-garde buildings are part of the redevelopment effort for the Lyon Confluence, a formerly derelict industrial zone where the Soane and Rhone rivers meet. As headquarters for the Cardinal Group and Euronews respectively, the aptly named Orange Cube and (more stretched out) Green Cube were designed by Paris-based Jakob + MacFarlane Architects. Both sport the distinguishing features of Day-Glo colors, an outer decorative ‘skin’ of laser cut, screen punched aluminum panels and conical voids that serve to provide lighting and cross breeze deep into the structures. Their neighbor is no less arresting: the futuristic structure of concrete and twisted metal is the brainchild of Viennese firm Coop Himmelb(l)au. A hi-tech cloud interpreted in aluminum and angular glass, this is home to the Musée des Confluences, the city’s edgy, eclectic, natural history museum. 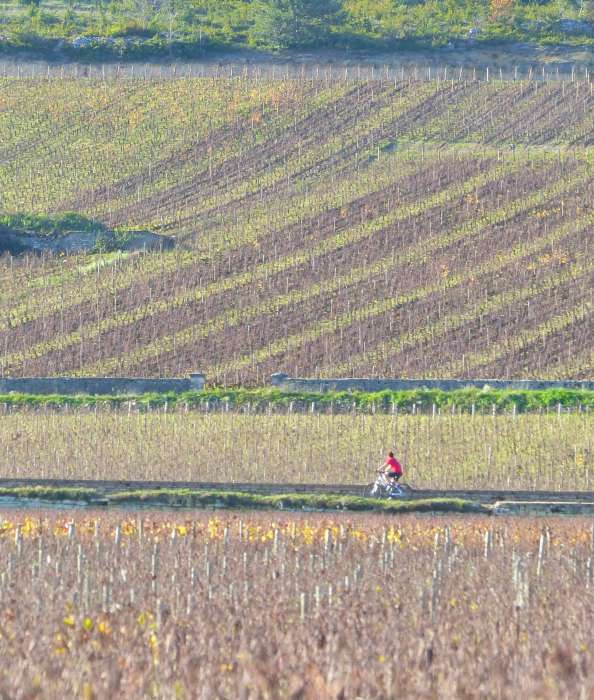 A lone cyclist in the Burgundy countryside. Up next is a Côte de Beaune Burgundy Wine Tour. Acres of vineyards spill around us and the relatively flat terrain makes cycling the perfect means of transport with some exercise thrown in! Tusked porcine outside a food shop. 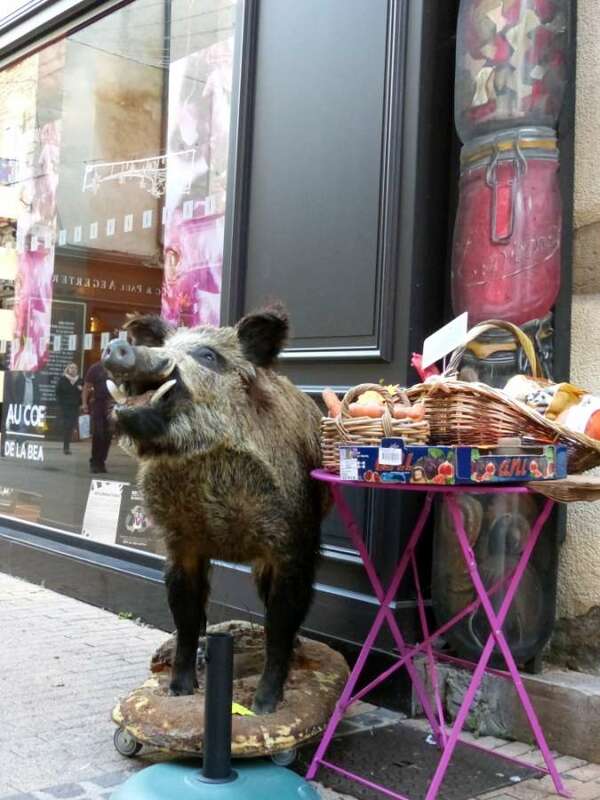 We were startled by the lifelike stuffed boar and found it was part of the store’s display: the table was smothered by heaping baskets of produce and the entrance was decorated with whimsical depictions of mason jars stuffed with mushrooms and other pickled veggies. 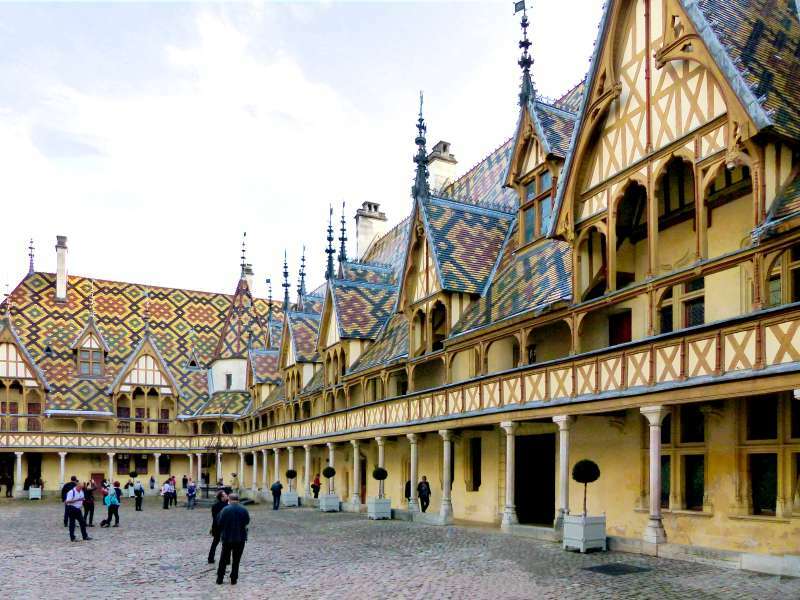 Hospices de Beaune with the ‘Burdgundian style’ polychrome roofing typical of the region. Also known as the Musee de l’Hotel-Dieu, the hospital-turned-museum is one of the best preserved renaissance buildings in Europe. The Great Hall has 30 curtained beds with a chapel at the other end. The wooden roof, shaped like the hull of an inverted boat, and supported by brightly painted carved beams livens up an otherwise somber space. Among the various displays on the grounds of Hospices de Beaune were the chapel’s 9-panel altarpiece by Flemish artist Rogier van der Weyden on the Last Judgement, the Hospice kitchen, and pharmacy. Le Voyageur (The Traveler) in Place Carnot. 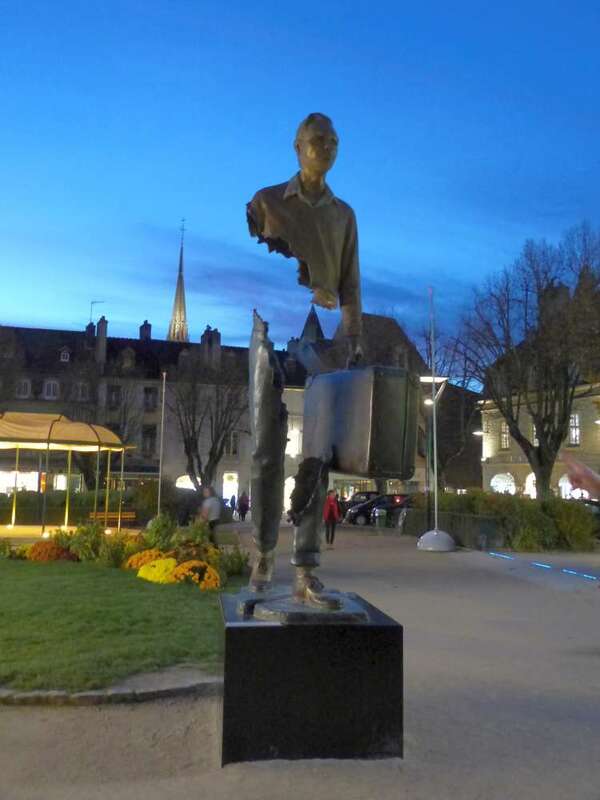 As dusk sets in, I spied this 12 ft high bronze sculpture by renowned French sculptor Bruno Catalano in Carnot Square. Catalano’s Traveler looks resolutely ahead, suitcase in hand, foot planted forward – except he has a see-though torso, and is missing one arm… Each person’s experience casts the Traveler in a different light. Is his journey voluntary or imposed? Is he incomplete because of what he left behind or is the sum of his parts secured in the suitcase? The questions played in our heads as we wrapped up the final tour of our cruise, transforming us, in turn, into reluctant travelers as we prepared to disembark at Chalon-sur-Saône and head for Paris. 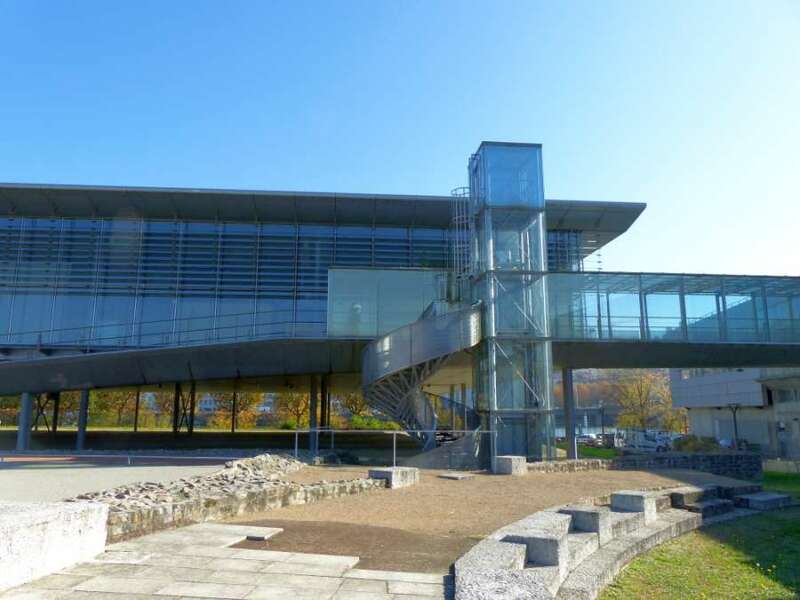 This entry was posted in Architecture, Travel and tagged Archaeological Museum of Saint-Romain-en-Gal, Beaune, Bruno Catalano, Burgundy, Coop Himmelb(l)au, Hospices de Beaune, Jakob + MacFarlane Architects, Lyon, Musée des Confluences, Vienne, World Heritage Site by Marie Chan. Bookmark the permalink.